Anand was directed by Singeetam Srinivasa Rao and co-starred Sudha Rani, Rajesh and Jayanthi. Film was a huge blockbuster hit celebrating 38 weeks in Karnataka. It was the first of his three super hits. Ratha Sapthami was directed by M. S. Rajashekar and co-starred Asharani, Parvathavani, Doddanna and Kanchana. Film was the second blockbuster hit of Shivaraj Kumar. Manamecchida Hudugi was directed by M. S. Rajashekar and co-starred Sudha Rani, Sundar Krishna Urs and N. N. Simha. Film story is based on Kannada novel “Bete” written by Kum. Veerabhadrappa. Film was a huge commercial hit and earned Shivaraj Kumar “Hat trick Hero” title. Samyuktha was directed by K. N. Chandrashekar and co-starred Veena, Chi Guru Dutt and Balaraj. Film was a huge musical hit. Ranaranga was directed by V. Somashekhar and co-starred Sudharani, Tara, C. R. Simha, Balakrishna and Jaggesh. 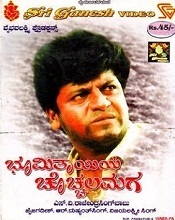 Mruthyunjaya was directed by Chi. Dattaraj and co-starred Malashri, Shashikumar and K. S. Ashwath. Film celebrated 100 days run at box office. Aralida Hoovugalu was directed by Chi. Dattaraj and co-starred Vidyashree, Chi Guru Dutt and K. S. Ashwath. Film completed 100 days run in Karnataka. Purushotthama was directed by M. S. Rajashekar and co-starred Shivaranjini, Madhubala and Srinath. Hamsalekha’s music was a huge hit. Jaga Mechhida Huduga was directed by H.R. Bhargava and co-starred Raagini, Srinath and Lakshmi. Film story is based on Kannada novel Nishaanth written by Sai Suthe. Ananda Jyothi was directed by Chi. Datta Raj and co-starred Sudharani, Rockline Venkatesh and Chi Guru Dutt. Om was directed by Upendra and co-starred Prema and Sadhu Kokila. Film is considered to be a trend setter in Kannada Industry, it is the first film to use real underworld people in casting, personalities like Jedarahalli Krishnappa, Korangu , Tanveer, Bekkina Kannu Raajendra appeared in the film. Film tells the story of young gangster madly falling in love with a girl and ready to do anything to get her. But at the end hero decides to quit the mafia to get his girl. Dore was directed by Shivamani and co-starred Hema Panchamukhi, Bharathi and Srinivasa Murthy. Film story is based on Kannada novel “Beliya Hoogalu” written by Ku. Veerabhadrappa. Janumada Jodi was directed by T. S. Nagabharana and co-starred Shilpa. Film tells the story of village young man falling in love with a girl belonging to a different caste. Film story is based on Gujarathi novel Malela Jiva written by Pannalal Patel. Nammoora Mandara Hoove was directed by Sunil Kumar Desai and co-starred Ramesh, Prema and Suman Nagarkar. Film was a blockbuster hit and celebrated 22-week run in karnataka. Film was remade in Tamil as Kangalin Vaarthaigal. Film tells the story of young man coming to village to spend few days with his friend. He meets a girl over there and falls in love with her, who is loved by his best friend. Rest of the story is about love triangle. Kurubana Rani was directed by D. Rajendra Babu and co-starred Nagma, Mukhyamantri Chandru Sumithra and Lokesh. Film tells the story of village man falling in love with heroine of the film whom he married during the filming of a movie. He thought he is married to the actress but in fact the director cast him as an extra. Rest of the story is how he wins her heart. Andaman was directed by P. H. Vishwanath and co-starred Soni and Vinaya Prasad. Bhoomi Thayiya Chochchala Maga was directed by Rajendra Singh Babu and co-starred Ramesh Aravind and Vijayalakshmi. Film tells the story of young friends sacrificing everything to help the farmers of village. A.K.47 was directed by Om Prakash Rao and co-starred Chandini and Om Puri. Movie was a huge commercial hit and celebrated 175 days run in Karnataka. Film tells the story of young man who by mistake was arrested for terrorist attacks. He is helped by a sincere police officer Om Puri. Preethse was directed by D Rajendra Babu and co-starred Upendra and Sonali Bendre. Film tells the story of young man madly falling in love with a girl and ready to do anything to get her. He even goes to the extent of killing her boyfriend to get her. It was remake of Bollywood super hit Darr. Baava Baamaida was directed by Kishore Sarja and co-starred Rambha and Prakash Raj. Film was remake of Tamil hit Pandithurai released in 1992. Thavarige Baa Thangi was directed by Om Sai Prakash and co-starred Anu Prabhakar, Radhika and Komal. Film was a super hit and was remade in Telugu as Puttintiki Ra Chelli. Film tells the story of love bonding between brother and sister. Chigurida Kanasu was directed by T. S. Nagabharana and co-starred Avinash and Rekha Unnikrishnan. Film story is based on novel written by Shivaram Karanth. Film tells the story of young man coming to village with a dream in his eyes. He is not content with his city life and he wants to do something meaningful. In the village he successfully builds a bridge and sets up a hydro electric Project. Rest of the story is how he is appreciated by his fellow people and antagonist plotting against him. Jogi was directed by Prem and co-starred Jennifer Kotwal, Arundathi Nag, Ramesh Bhat and Kishan Shrikanth. Film was a tremendous box office hit breaking several records at box office, it became the highest grossing film of Kannada film industry and collected more than INR22 crores at box office. Film tells the story of young village man coming to city searching for a job. He accidentally involves in a gangster war and becomes the biggest gangster of city. His mother comes to city searching for him and dies accidentally, hero performs her last rights rituals without realizing that it was his mother. Satya in Love was directed by Raghav Loki and co-starred Genelia and Komal Kumar. Film was a commercial hit and celebrated 50 days run in 19 centers, 100 days run in 3 centers of Karnataka. Film tells the story of man falling in love with a girl while nursing epileptic attack. Heroine vanishes into the crowd and hero starts searching for her. She is the daughter of Andra don and when he reaches her house he was beaten by villain’s goons. Heroine is also shocked to see him there. Bhajarangi was directed by Harsha and co-starred Aindrita Ray and Rukmini Vijayakumar. Film was a blockbuster hit of the year and grossed INR12.5 crores in just three weeks. Film tells the story of young man coming to a village to save people from a black magic expert who looted, raped and killed many villagers. Hero comes to know that his grandfather was a legend who saved these villagers from this tantrik. Rest of the story is how he takes revenge for the death of grandfather.